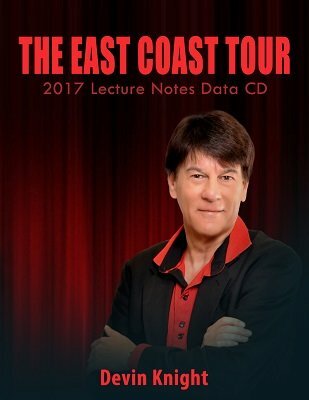 All the PDFs and videos from the CD that Devin Knight sold at his final East Coast Lecture tour. This is the bargain of the century as it would cost you $91.00 to buy these separately. Each PDF fully explains how to make up each trick. To buy these tricks ready made from a magic dealer would cost over $300.00. QUADRUPLE PREDICTION - An amazing mental effect where the magician correctly predicts cards and colors despite odds of over 16,000 to 1 against it. A real stunner you can close a show with. PSYCHIC MONEY SENSE - Designed for an intimate close up show, this experiment apparently shows that a spectator has an excellent psychic sense as he achieves an impossible outcome using three pay envelopes and some ordinary coins. PUZZLE MANIA - A brilliant routine which is perfect for children's shows. Both the magician and then the birthday child, manage to correctly guess which pieces have been removed from a completed tray puzzle. AQUA-COIN FLIGHT - A practical parlor routine. Three different value marked coins are dropped by a spectator into a tall thin glass of water and one is then selected. Without sleights or difficult moves, the marked coin vanishes from the glass and ends up inside a sealed envelope. BLINDSIGHT OUTDONE - A version that fools those who know the original. A spectator correctly guesses the colors sealed in four envelopes. No gimmick markers. KNOCKOUT TOSSED DECK - New tossed out deck where 5 people peek at a card and each sits down one at a time as each card is revealed. THE ASSISTANT TEST - A comedy warmup that always gets laughter from an audience as the magician explains a test he uses to hire assistants. BREAKFAST PACK MATCH - An amazing mental trick for kids using small packets of cereal. AUTO-SPELL DECK - A spectator freely selects a card (no force) the card is pushed into the center of the deck. The magician gives the deck one cut and immediately spells to the card. Self-working. THE GREAT APPLE HEIST - A great trick for kid shows, especially at Halloween. Two kids take an equal turn at removing apples from a bowl. Yet one child ends up with 5 apples and the other 2 apples. Baffling to an audience. Magician directs from a distance. THE NTE PRINCIPLE - A card feat that can be done over the radio. The magician shows the audience how to program their deck into a smart deck and proceeds to locate everyone's chosen card over the radio. A great publicity stunt that will get you booked on radio shows. RUNNING CUT FORCE - A superior force where a spectator stops the magician anywhere during a running cut. Yet, that card is forced without any sleights or slip cuts.